New baby goat at my daughter’s farm. Did you ever think you would see them again??? Sunny Sundays that is. After I finished weeding this morning, I sat on the bench in my garden and counted the birds who came to feed. If I had a fancy camera, I would take photos of all the back yard visitors…some back from the south, like Timothy Titmouse who showed up this week, and most singing their hearts out and enjoying the fine day. John the gardener says he’s taking off next weekend to take his wife for a run around the Tidal Basin where the cherry trees (early varieties) should be in full bloom. More power to him, he’s been working hard for me the past few weeks. My oldest son is in town from San Diego, taking a management course at the Navy Yard in D.C. He and his sister drove down to meet my younger son and clear their personal possessions from their dad’s house. The ‘wicked’ stepmother (who lives elsewhere) was there to supervise (long awful story, not to be told here). Later this week David and I will meet my son for an evening meal before he heads back to California. I will see Richard and his family when I make a trip to San Diego this fall, where I will also link up with Mage over at Postcards. She says she is going to take me to see her Thrift Shop. Fun all around. So far so good with the cortisone shot for the bursa in my right hip. I’ve slept well the past few nights. I also lost 2 more pounds this week. That’s a grand total of 30 pounds so far. I am now 10 pounds from my base goal. I intend to reset the goal and lose 20 more pounds after I reach base camp. I have my physical in May and hope to finally impress my GP with my progress. However, he never offers any praise, just a lecture on cabbage soup. Cabbage is okay, chocolate is better. This post linked to Nature Notes. This entry was posted in Birds, Cooking and Food, Elder Blogger, Gardening and Gardens, Health/Medical Stuff, Retirement Living by SchmidleysScribblins. Bookmark the permalink. 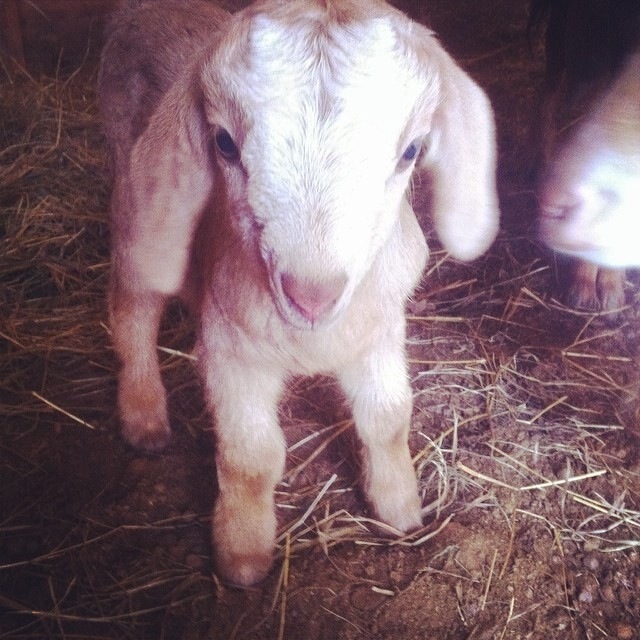 Darling baby goat! Congratulations on your weight loss!! I failed miserably on the Weight Watchers Plan. It had me always thinking about food, which made me ravenous! Congrats on your weight loss! Stopping in from Michelle’s Nature Notes.. Love the baby goat! Glad you are doing well on your diet..Congrats! I have not tried Cabbage soup, is it good? Enjoy your day! Great shot of the baby goat. I’m glad the cortisone shot helped. Yes, crossed fingers, it seems to have helped my hip. My knee is stil painful, but not as bad. Almost forgot, great that you will be seeing your family soon. Envy you the trip to San Diego. Yes. SD is almost heaven, but don’t tell anyone. I have the Weight Watcher’s Cabbage Soup recipe. We love cabbage in any shape or form in this house. I think I will make some next time as it’s a good recipe. Good for you losing 10 lbs. I have lost 8 lbs. which I am thrilled about but none this week. Good news is at least I didn’t put any on. I have started making Gregg bread in the bread machine as he loves it. Need I say more? Just too tempting but I’ll do better this week, I am determined! Your doctor should give you a pat on the back, no lectures! Wasn’t the weekend glorious? Loved all that sunshine and seeing the daffodils in bloom. Your Doctor gave you lecture on cabbage soup? You’ve got to be kidding. I try really hard to lead a healthy lifestyle — eat well and all that rot, but cabbage soup? Good grief . Oh that upset me so much I almost forgot to comment on the rest of your post which was so interesting — glad you had a chance to visit with your kids; the cortisone is working; you are doing great on your diet; the baby goat is adorable; spring is coming …. it really is a happy post overall and I don’t know why I let that cabbage soup upset me so. ;>) Also I like your new wallpaper. Thanks Sallie. Don’t let the cabbage get you down. Lwnt will soon be over, will you go back on the chocolate then? I never even stopped although I could do with losing a few pounds too. I think I’ll go easy on bread and potatoes and keep up with the daily medicinal bit of chocolate. Isn’t it great, we can garden again although sitting on a bench in the sunshine isn’t bad either. My creaky joints actually prefer that. I never gave it up. I eat an ounce of chocolate every day. I eat potatoes too. On Weight Watchers you can eat what you want as long as you stay within your allocation of points. As far as I’m concerned a sunny day cures lots of ills – enjoy your time with your family. Hopefully it will be a sunny day! I try to stay heathy. Much better since I retired. Congratulations on your progress losing weight. It is a great accomplishment, with or without the doctor’s kudos. How about stuffed cabbage…maybe stuffed with chocolate for a change! Thanks Meryl. I like my chocolate neat. I am glad life for you is improving. It must be due to the sunshine, not the cabbage. Maybe you are onto something. Cabbage soup, I doubt is there can be anything worse. Why, all it would do is fill the body with gas and wind! Hey, I’m not promoting the stuff. I eat chocolate! I am on your side, afterall a little of what you fancy, does you good! The only diet I follow is the one my mother promoted: A good mixed diet, plenty of exercise and no jumping on a weighing scales! Now if someone could just come up with a recipe for chocolate flavoured cabbage…. Good for you on the weight loss! It’s amazing how much healthier we feel after shedding some pounds. Someone will probably try it. I mean, we do have chocolate covered ants. I’ve never tried them, but I don’t think they would taste very good owing to the formic acid in the ant bodies. Even birds won’t eat ants.